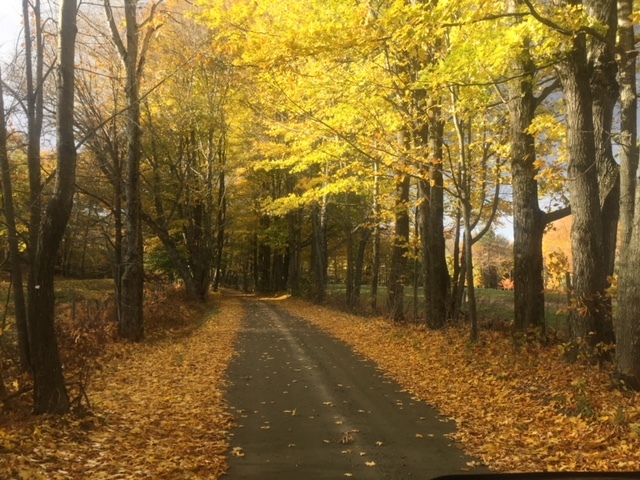 One of my favorite roads near Woodstock during fall foliage. We are drawn to certain places. Not just as enticing vacation spots, but a deep, emotional pull that begins before we arrive and continues long after we’ve left. There also are places we have an aversion to. Two hours there and we’re feeling uneasy and maybe even a little down. For me, “the power of place” is more than just an interesting concept. It’s a serious condition with serious symptoms. Here’s an example: Admiring the vast expanse of the Rocky Mountains, I find myself fighting off a sense of loneliness, bordering on despair. Although I can appreciate the grandeur of the landscape, I feel disconnected from it. Meanwhile, the person right next to me is having a spiritual experience. Or this: Visiting friends in the sprawling suburbs (who happen to love where they live), I feel like I could take a nap; I’m unusually tired and listless. And forget the desert. I’m completely depressed in the desert. But give me a dramatic, rocky coastline, some green rolling hills, and the sweet smell of a dairy farm, and I’m filled with an indescribable sense of wellbeing. My energy and creativity soar. I am in my element. SUBHED: Why this deep connection to certain places? Although I was born and raised in the South, I felt at home the moment I put my big toe in New England nearly 25 years ago. When I left, I experienced a deep sense of emptiness and a longing to return. After college, I lived in the mountains of New Hampshire for a year before moving away again. The homesickness returned, along with something I can only describe as sensory deprivation. I yearned for the fragrance of pine and wood smoke, the squeak-squeak of the snow on a sub-zero morning, the brisk waters of lakes and streams. From a wider lens, I missed the culture: the intimacy of New England villages, the seasonal celebrations, the sense of history and tradition. It took another 10 years before I would make a permanent move to Vermont. In the meantime, I lived in and visited many beautiful places, but they weren’t home. I’m not alone in this experience. I’ve met many people from “away” who have come “home” to Vermont. Every year publications release their “best places to live” lists, based entirely on statistics and polls. I find these reports amusing. Just because a place looks good on paper and other people love living there doesn’t mean that you will too. Unfortunately, a lot of people discover this the hard way. Several years ago our family embarked on a three-week road trip out west. We saw remarkable things during our travels, and spent time in areas some people consider optimal places to live. They’re drawn to these places in much the same way I’m drawn to the Northeast, specifically Vermont. Although I took 600 photos of spectacular scenery over the course of our travels, I did not come across one spot where I thought I might want to live. There are many magnificent places in this world. I hope to visit more of them. But it takes more than a beautiful landscape, good schools, nice weather, and a wealth of cultural opportunities to make a place feel like home. The field of ecopsychology, which studies the relationship between humans and the natural world, offers interesting possibilities as we seek to understand our seemingly innate “draw” to certain environments. As I continue to dig into this fascinating topic, I look forward to sharing my thoughts and findings with you here. Whatever the reason, the power of place is very real. It moves, defines, and shapes us. It also affects our attitudes about sustainability. Research shows that when we feel connected to a location, particularly natural environments, we’re more likely to engage in actions of sustainability. To care for the place we love. Is the Woodstock area “home” for you? Amanda Kuhnert serves on the board of Sustainable Woodstock. She writes regularly on her blog ourmerryway.com. DO JUST ONE THING: Take a walk along your favorite road or trail. What draws you to that particular place?